Hey guys! Sorry I haven't been posting in a while--life has been busy and I've been feeling so drained at the end of every day. So I am very relieved that the weekend is finally here! 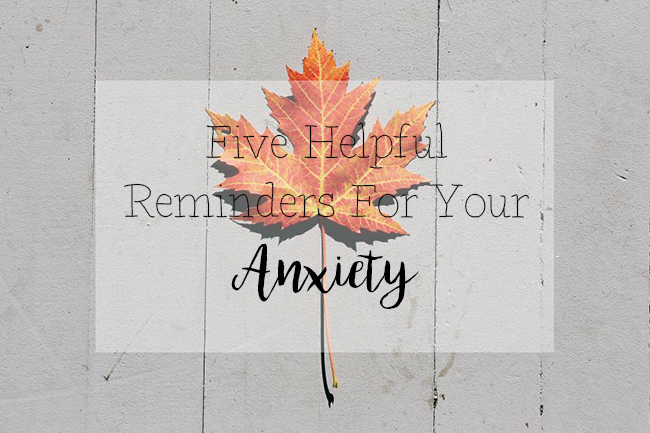 I thought that I could share some love and give you some nice reminders to tell yourself whenever you feel anxious. When life gets hectic, it can get stressful, so it's nice to remind yourself that you can get through anything. 1. You're not stuck. Sometimes when you start to panic, you feel like you're stuck with only two solutions for the problem you're facing, but there are other options than the ones you think you have right now. This is one of the hardest things to get past, but once you realize that the situation is not black and white, you'll be able to handle your stress much easier. 2. Take things one step at a time. Whenever I feel stressed, having a lot on my plate overwhelms me even more. A great thing to remember is to take things one step at a time. Finish one project, one errand, one chore before starting another. Having control over this lessens the anxious feeling of losing control. 3. Talk it out. It's not great to keep everything bottled up. Sometimes the best way to get rid of your worries is to talk it out. There is always someone there to listen and to help you get through your troubles. Even if you write it down in a journal, having your thoughts out in the open relieves some of the stress. 4. You are strong. During these times, we feel our weakest. We feel lost and like we have no way out, but it's important to remember that you are stronger than you think. Remind yourself that you have gotten through this before, so you can do it again. 5. This will pass. This will not last forever, even though it might seem like it will. Focus on the positive and you'll get through it. Quote of the day: "A smooth sea never made a skillful sailor." The QOTD is one of my faves! Mine too! I painted it on a canvas once and hung it in my room at college as a reminder.